Your Family Owned Destination Garden Center Of Harbor Country, Southwestern Michigan And Beyond! The days are growing shorter and the temperatures are growing cooler, but even in September, gardening season isn't over. Well-prepared gardeners have a variety of tasks to do in late summer and early fall, and each chore will help keep the garden thriving. In areas with shorter growing seasons, September is ideal for clearing out the garden. Remove debris and dead plants, repair walls or fences and keep weeding the garden so the area is ready for spring. If fall produce is part of the garden, this is the time to begin harvesting and preserving that bounty. Squashes, pumpkins, potatoes, apples, pears and autumn raspberries can all be harvested in September. Garden soil is easily amended in September after plants are harvested. A thick layer of compost, manure or shredded leaves can be added to the soil and it will decay into rich nutrients over the winter. Long before frost warnings are regularly part of the weather forecast, mulch layers should be deepened to protect roots and young plants so they can survive the winter. A layer 3-4 inches deep is ideal. As summer flowers wane, allow some blooms to go to seed and collect those seeds for next year's flowerbeds. The seeds should be allowed to come loose from the blooms as they dry, then stored in a cool, dry place. September is the time to divide perennials that are growing too large or thick. Daylilies, irises, phlox and other popular plants are good candidates for fall relocations, and they will easily set into their new spots. Hardy bulbs that are popular in spring gardens can be easily planted in fall, ensuring they are ready to bloom at the earliest opportunity after winter. Crocuses, tulips, daffodils and hyacinths all take well to September planting. Not all flower bulbs can survive heavy freezes and long winters, and if cannas, gladioluses or other tender bulbs are part of the garden, they should be dug up in September and stored in a cool, dry, dark place until spring. New flowers can be planted to add autumn color to the garden in September. 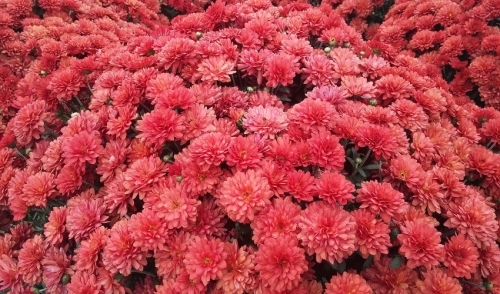 Chrysanthemums are the most popular choice but ornamental kale and cabbage also add great color and texture to fall flowerbeds. September is a great time to add new trees and shrubs to the landscape, since the roots will thrive in warm soil and the plants can become established before winter. Evergreens are especially easy to plant in fall. Newly planted trees and shrubs should continue to be thoroughly watered in September. Proper hydration will help strengthen roots, stems and trunks so they can survive the winter with less stress and damage. September is the time to bring aromatic and delicious herbs inside for tasty winter use. Cuttings of herbs can be repotted in the late summer and early autumn and will be ready to season dishes for hearty winter meals. Garden centers and nurseries clear out their stock in September to make room for winter supplies, and this is a great time to stock up on potting soil, pots, tools and other supplies, as well as discounted plants. The rush of summer gardening may be finishing up in September, but there is always something for the savvy gardener to do! © 2019 Sawyer Garden Center. All rights reserved.